For the last couple of years, Miranda had been very focused on regaining her self-worth after fleeing an extremely abusive relationship. In the past year that I have known her, I had seen an remarkable positive shift, yes her journey for periods of time were a constant uphill, but she didn’t allow herself to stay in those low moments for too long. Miranda was determined and kept her eye what she wanted for her life and that was to heal herself so that she could once again be of service to others. It was during Miranda’s second Reconnective Healing session that one of the most incredible physical manifestations I have ever witnessed occurred. 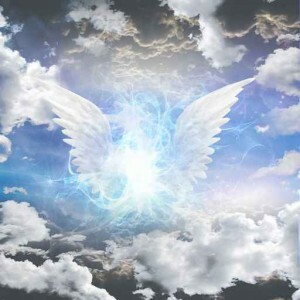 Shortly after I started the session I was given the message that Archangel Uriel was present in the room, I remember stopping what I was doing and I opened my eyes. It was strange, as if the room was filled with midst, cloudy – I looked around and everything in the room looked softer, all the angles were rounded and there was also a profound sense of calm and peace. I closed my eyes and continued with the session. When I finished, I gently tapped Miranda’s shoulder and asked her to slowly open her eyes; I stood back from the massage table and leaned against my desk and waited. I shared with her the experience I had with Archangel Uriel coming into the session and the feeling in the room. She was thrilled to hear of it! From the corner of my eye I caught sight of a feather on the ground in front of me. I looked straight down, I could not believe my eyes – there was a large, fluffy 2-inch white feather in front of me; I bent down, picked it up and showed it to her. We both stared at one another with big smiles. Miranda told me that at the beginning of the session she had asked for a sign and this was IT! Really, there was no explanation for the feather being there. This beautiful feather did not appear on the floor until the end of the session. It was there for Miranda.